Vengaya chutney is all time favourite chutney,You can feel the tongue tickling taste of Red hot chilli,sweetness of Onion shallots and sour taste of Tamarind grind along with salt makes great taste to match with all type of Dosa and Idlies. Peel the skin of shallots and keep it ready,1 cup. Heat pan with one teaspoon of oil,temper with mustard and urid dal,then add asafoetida and red chilli. 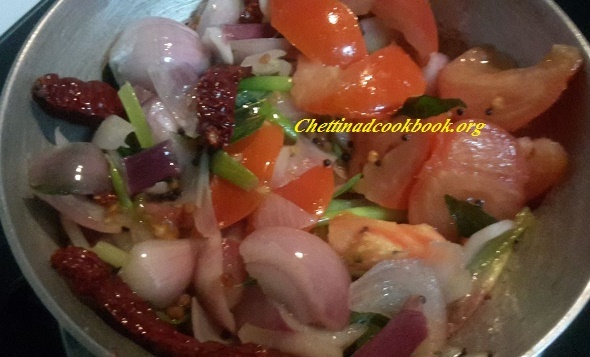 Add skin peeled onion saute well till half cooked, add tomato and cook well,add curry leaves and switch off stove. When the sauted mixer gets warm grind it to paste,no need to add water while grinding. Again heat another pan and add oil. When the oil is hot, add mustard seeds. When the mustard seeds starts to sputter, add curry leaves and fry for 10 seconds and then remove from flame and add it to the ground Vengaya Chutney (Onion Chutney). 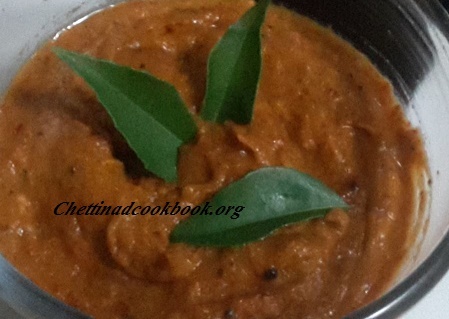 Serve with any type of Dosa,Uthappam or Idly.